Bring a taste of Italy to your kitchen! Our pasta recipe keeps it light and authentic. In a large pot, sauté onions in olive oil until soft. Add tomatoes and cook for another 10 minutes stirring occasionally. When veggies are soft, stir in rosemary leaves, butter, salt, and pepper. (You may add some water if too thick). Follow the cooking instructions and time on the box and CAREFULLY drain the pasta in a strainer placed in a sink. Lift the strainer from the sink (no rinsing is required) and place the strainer on top of the pot or on a paper towel to absorb excess water. 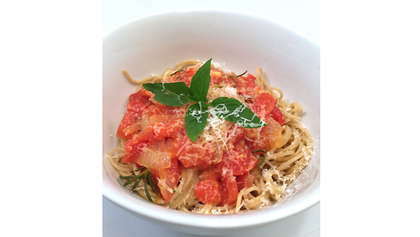 Place a serving of pasta in each bowl, and top with a pasta sauce, and sprinkle with grated Parmesan cheese.